The Islamic Republic of Afghanistan flag began to be used in 2002 by the new government but was formalized in early 2004. Afghanistan has had the most changes to its national flag in the 20th century than any other country in the world! The Afghanistan flag is one of four main national symbols of Afghanistan. For the past five years, the official design is three vertical stripes of equal length, black, red, and green, with the Afghan National Emblem in the middle. 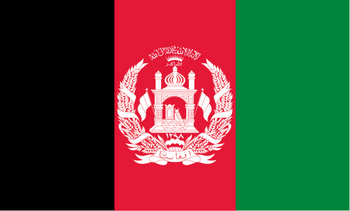 The current Afghan national flag is three stripes of black, red, and green in that order, beginning with the black from left to right. Black represents the past - numerous past versions of the flag were black, and indicates the period in history when Afghanistan was an occupied country. Red represents the blood shed to free Afghanistan from foreign rulers and specifically from the British-Afghan war in the 19th century. Green is the color of Islam, but also represents new hope for the future. It is believed to have been originally created by the Afghan master artist Brezhna (deceased) in the time of King Amanullah. This is from an unpublished book about Brezhna. The emblem has been modified several times. Today, the Afghan national emblem in the middle of the Afghan flag is white. (a mehrab (mihrab) is the niche in the wall of a mosque showing the direction of the qibla. The qibla shows the direction to pray so that Muslims are facing the Kabaa in Mecca when they bow. The Shahada, written in Arabic, which is the first part of the five pillars of Islam, "There no god but Allah, and Mohammed is his prophet." Underneath the Shahada are. the words "Allah Akbar" which means "God is great." Two flags are attached to the mosque, and these are the flags of Afghanistan. On the scroll beneath the mosque is written "Afghanistan." There are two wheat sheaves around the mosque, representing one of the main crops of Afghanistan. The only date on the emblem is the year 1298 (Islamic solar calendar). This date is 1919 A.D., when Afghanistan won independence from the British.